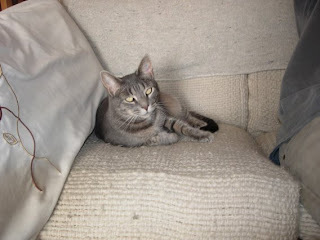 It was a Saturday night and Mike was due home the next Wednesday, when Pushy, our gray tabby cat started throwing up. On Sunday only the supermarkets are open in the city and there was nothing I could do for her till Monday morning. Sunday night I noticed it was worms and I looked up the word "gosorno" before I set out to the vet early on Monday. After a spanish discussion about the size and shape of the "gosornos" (en la vomita, blanco, etc...). She sold me some pills and I gave Pushy her first dose with the reluctant help of a very sleepy Chloe. The next morning I followed through and gave Pushy her second pill and .... She stopped eating or drinking. Then Mike called, his plane is delayed. So I called a vet that could visit my house. She was very friendly and spoke great english. She said the worms were not some crazy South American parasite, but were actually from New York. Pushy was riddled with them. The medicine I gave her was too strong and damaged her liver. We gave her an IV of fluids and I started giving her medicine to help her liver every hour. Then Mike called his plane was delayed again. The next day we ran all over the city getting school supplies. I gave Pushy her meds and I called the vet again. She came in and gave her more fluids. She said her intestine was blocked by the "gosornos". Call if she throws up. Friday came and after a morning of disappointment (no Mike at the airport), I found that Pushy had vomited. The vet rushed over. Now I needed to give her two medicines every hour. Well it was a long weekend of preparing for school and caring for the cat, all the while Mike's plane is delayed again and again... On Sunday afternoon, Pushy couldn't hold on any longer and died. Our vet, Goya, came and consoled the girls as best she could and took Pushy to bury in her garden. 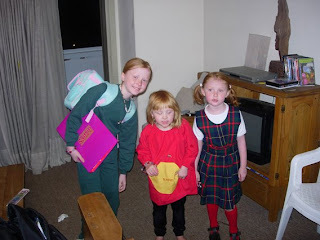 It was the night before their first day of school in a new country. The girls woke up crying over and over..... By morning they were exhausted and nervous and so was I. It seemed like such a disaster. At 11am Mike called. He made it to BUENOS AIRES! He was finally coming home. At 5pm the kids came off the bus. They were so happy. School was great! The children were so excited to practice speaking english with the girls. They made new friends and shared their pretzels at lunch,(pretzels are new here). Mike arrived home one hour later. These are some pictures from that first week. 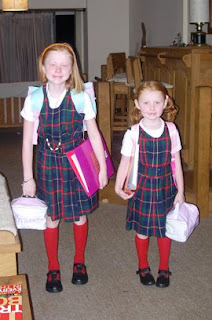 As you can see they wear a uniform every day. Everyone does, public schools, private schools. Even the teachers wear a uniform. The kids are going to a local bilingual school called Colegio del Sol. All three girls attend a full day of school from 8:40am to 4:30pm, except Fridays which is always a half day. Both Naomi and Phoebe are adapting well even though the kids in their grades know little to no english. Chloe has made numerous friends, has had several playdates and is going to a birthday party on Friday. Academically though she has the greatest challenge. All the children in her grade have mastered cursive writing, but she has only just started this, and is having trouble reading the board. Also the math is more advanced and is taught in spanish. All in all it's a good school for them. Every week they have music, art, drama, and go to a nearby club for phys ed (the school is small and has no gym). The woman who made Naomi's uniform for school has a cat. It had kittens and she has promised us one for next week.